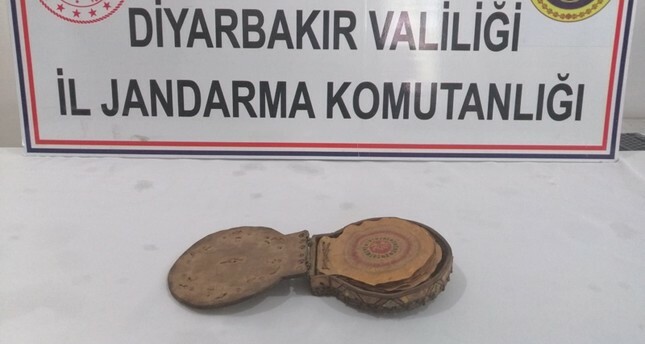 Turkish police seized a 1,100-year-old religious book written in Hebrew in an anti-smuggling operation carried out in southeastern Diyarbakır province. Anti-smuggling teams carried out the operation in Bismil and Ergani districts, where four suspects were seeking buyers to sell the ancient book, a statement released by the Diyarbakır Governorate said. Police caught the suspects red-handed as they were trying to sell the gold-gilded ancient book. The governorate noted that police launched an investigation into the incident and detained six suspects involved in the illegal sale. Consisting of 21 pages, the ancient book has a leather cover and has been placed under protection, the governorate added. Turkish security forces regularly carry out raids against smugglers with the goal of protecting historical artifacts discovered in the country or brought in from neighboring countries, mainly from war-torn Syria and Iraq. The government has established a parliamentary investigative committee on the country's stolen cultural artifacts, who will visit countries holding the smuggled items.